The long await and anticipation of Hudson Yards is almost over, with the Grand Opening scheduled for next week. We have been following the development and progress of what is America’s largest Real Estate development project. 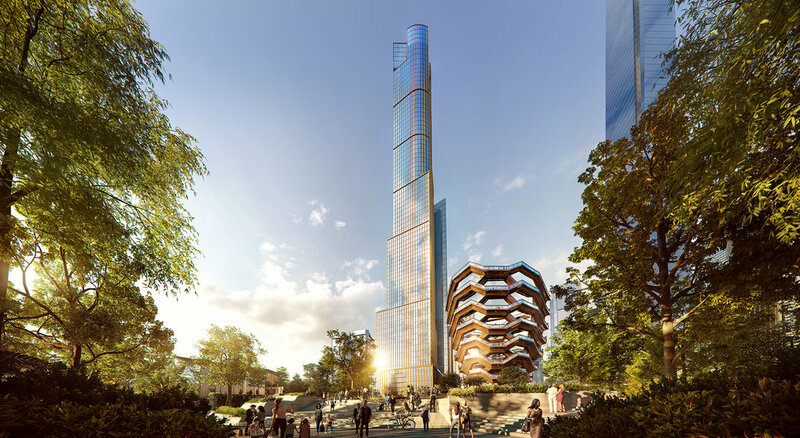 From Condos and Rentals to dining and shopping, Hudson Yards will be a true epicenter of the Far West Side. 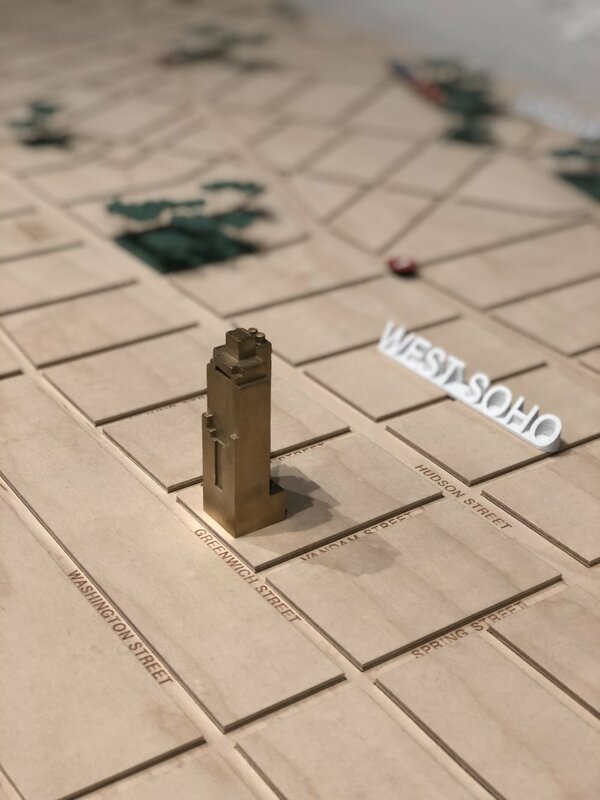 In fact, a new neighborhood has even popped up on the radar dubbed “SoHY”, or South of Hudson Yards. 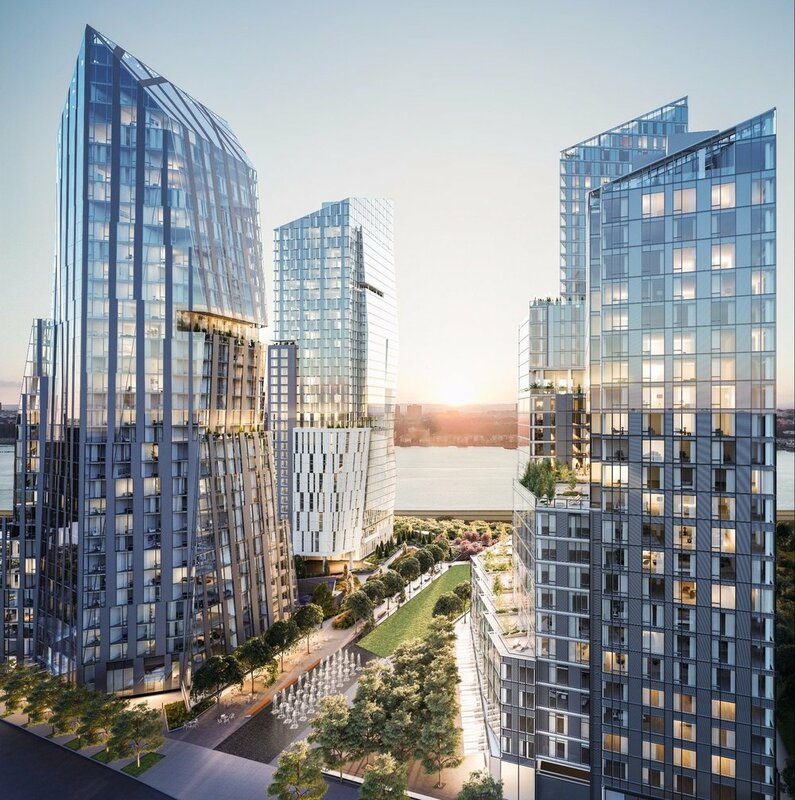 We covered the launch of 15 Hudson Yards, one of the residential condominiums that is part of the project, and now, we are learning details about 35 Hudson Yards which is expected to launch sales next week along with the Grand Opening. 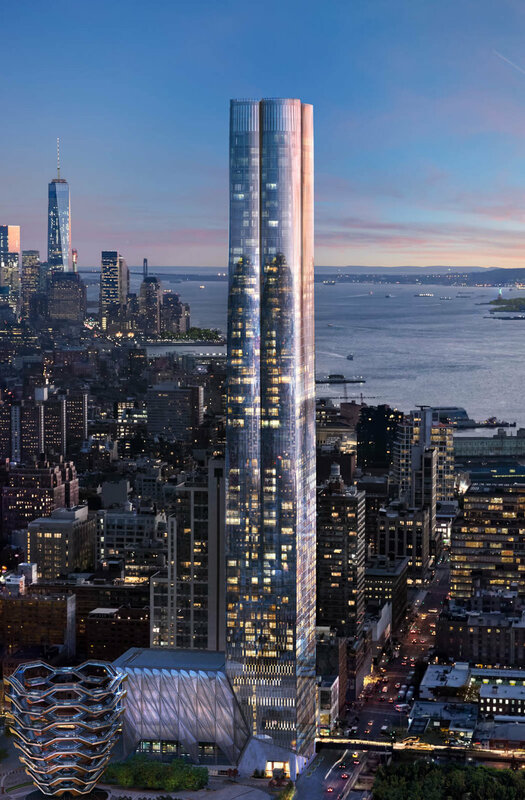 If you thought 15 Hudson Yards was luxurious and jaw-dropping, wait until you see 35 Hudson Yards. 35 Hudson Yards is designed by David Childs and Skidmore Owings & Merrill with interiors by Tony Ingrao. The building will rise 92 stories, making it the tallest residential building within the Hudson Yards project. There will be 143 residences starting on the 53rd floor and ranging in size from 2 to 6 bedrooms. Pricing is anticipated from $5M. 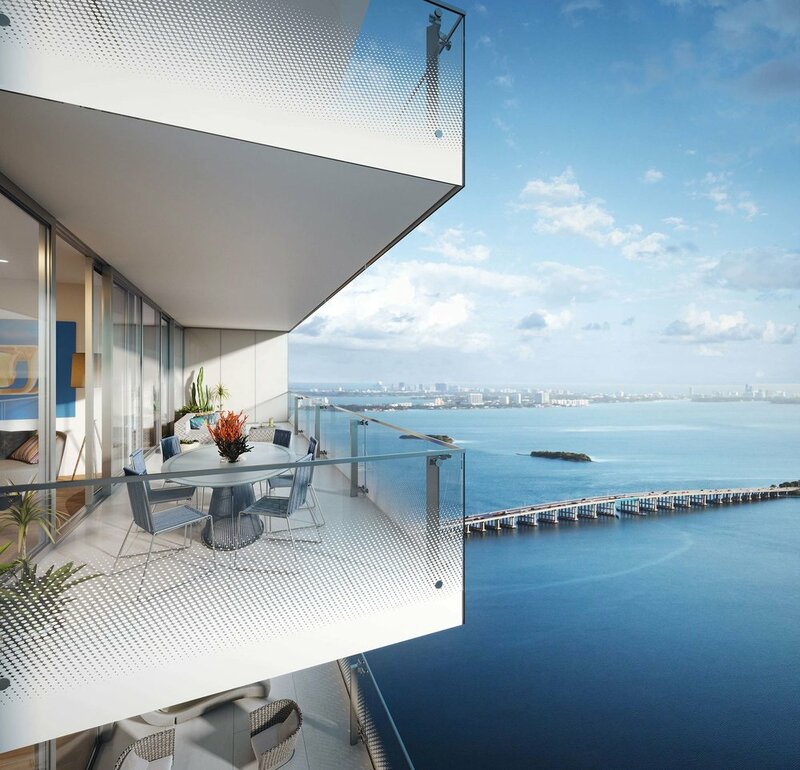 Residences range in size from 1,500 to 10,000 square feet. They will feature gracious entry foyers and ample wall space for art. Ceilings are 11 feet. In regard to finishes, there will be smoked oak flooring throughout the homes. 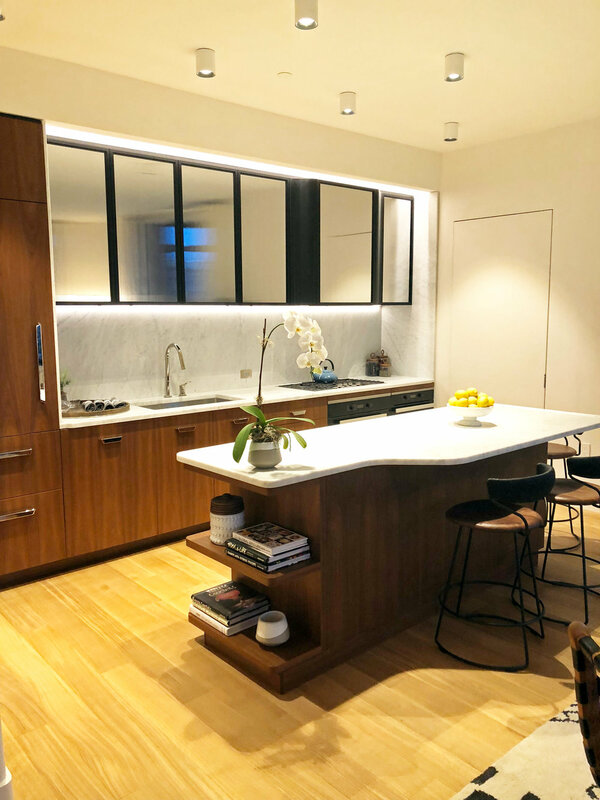 Luxurious kitchens are designed by Tony Ingrao in collaboration with Smallbone of Devizes and feature Gaggenau appliances, white opal marble counters, and high gloss stained Eucalyptus cabinets. Homes are sure to offer stunning and sweeping views of the Manhattan Skyline and of the Hudson River. 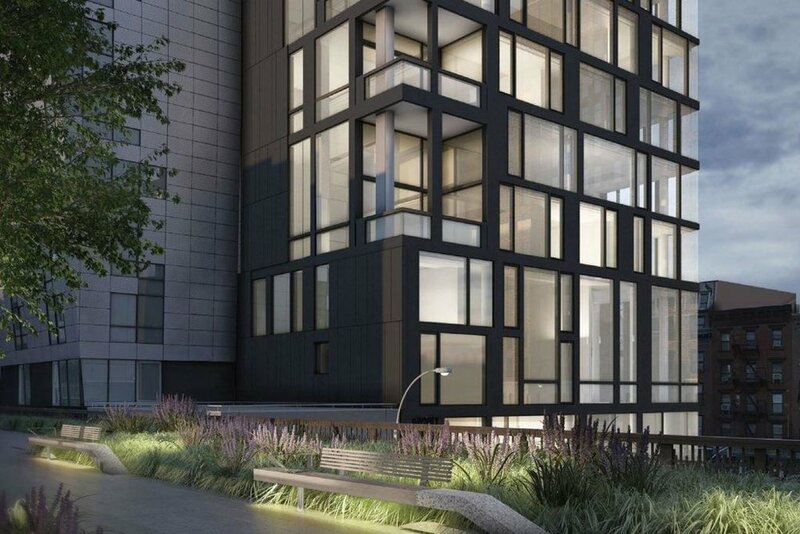 Residents of 35 Hudson Yards will enjoy a host of amenities and hotel-style service. There will be 22,000 square feet devoted to wellness and entertainment. In addition to this space, the building will be home to a 60,000 square foot Equinox as well as the world’s first ever Equinox Hotel. 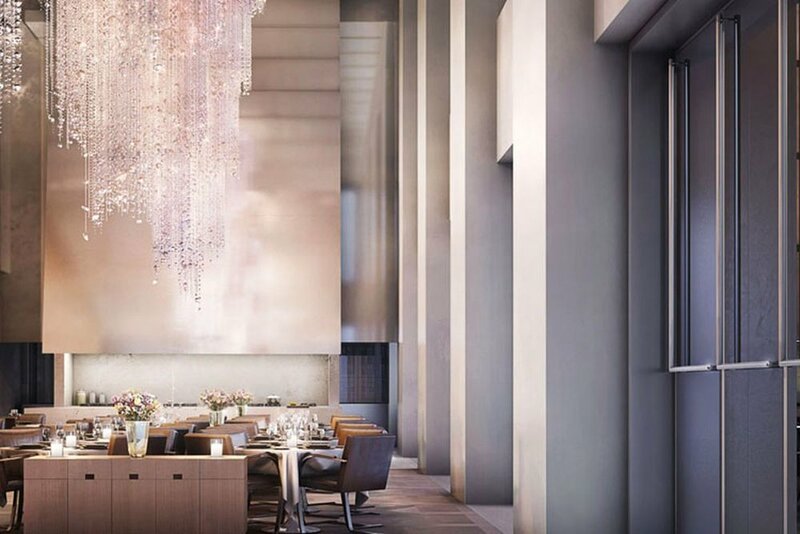 In addition to the in-building amenities, residents enjoy all the amenities that come along with calling Hudson Yards home – there will be myriad world-class dining and shopping options, including New York City’s first Neiman Marcus. Stay tuned for more information about the Grand Opening of Hudson Yards! We’ve written about the lavish amenity offerings that have changed luxury real estate in a landscape where high-end inventory is up and competition among new developments is tough. 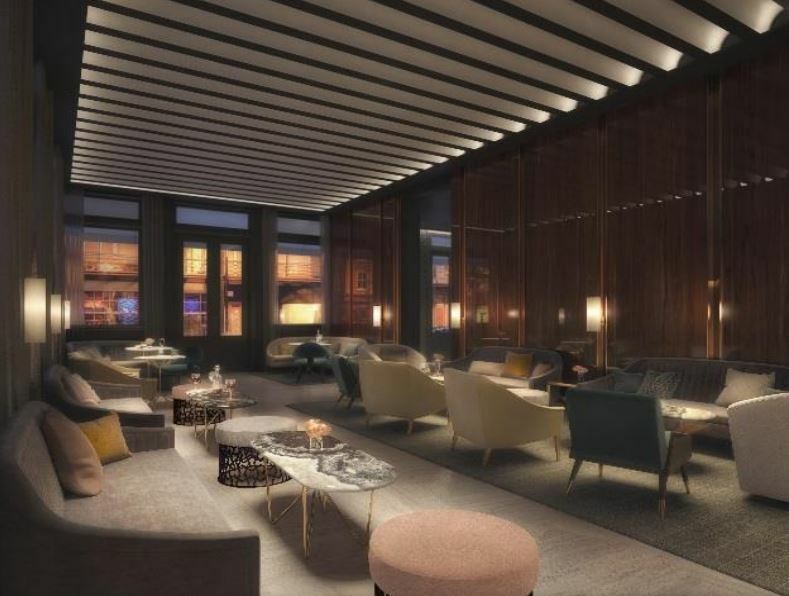 Some of the most exclusive buildings offer residents a unique experience, one that will cost you even more than a SoHo House membership since admission will require the purchase of a unit in the building…residents-only dining. Amenities are an extension of the residents’ homes, and restaurants take this to a new level with sophisticated private dining by top chefs only available to residents and their guests. These types of buyers look for convenience, but do not want to sacrifice quality to achieve that. These restaurants allow busy people with demanding careers to come home and not worry about cooking, hosting business lunches, or catering a dinner party. 432 Park Avenue made a name for itself as the tallest residential building in the Western hemisphere as well as for its tall prices for units in the building. The building amenity package is unrivaled, with the exclusive restaurant occupying the entire 12th floor. The restaurant is headed by Michelin-starred chef, Shaun Hergatt. 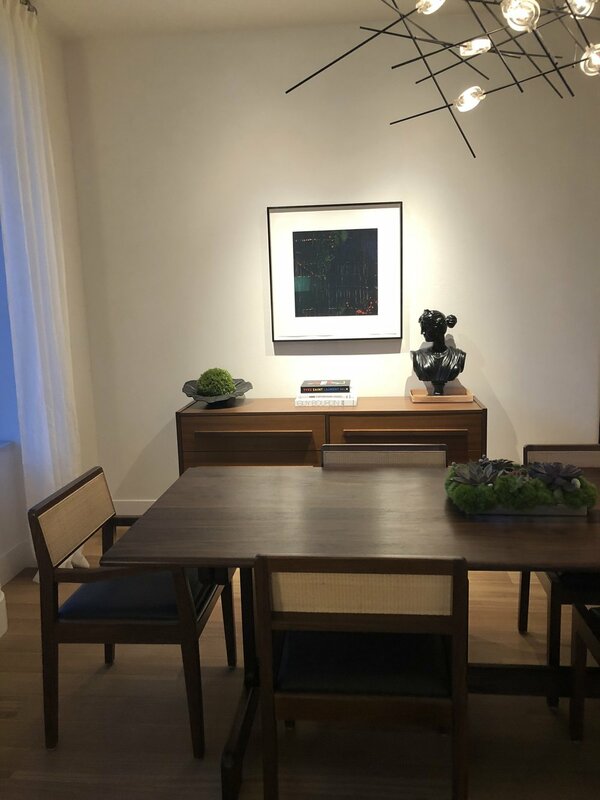 In addition to the interior dining room, the space also has a 5,000 square foot terrace overlooking 57th Street which can be reserved for private events. If you aren’t in the mood to eat in the restaurant on the 12th floor, in-residence dining is also available. 15 Central Park West made a splash among the world’s elite as it quickly became an “it” address recognized across the globe upon completion. It set the bar high in terms of luxury offerings, including a private restaurant for residents and their guests. The restaurant at 15 CPW debuted before that of 432 Park Avenue. 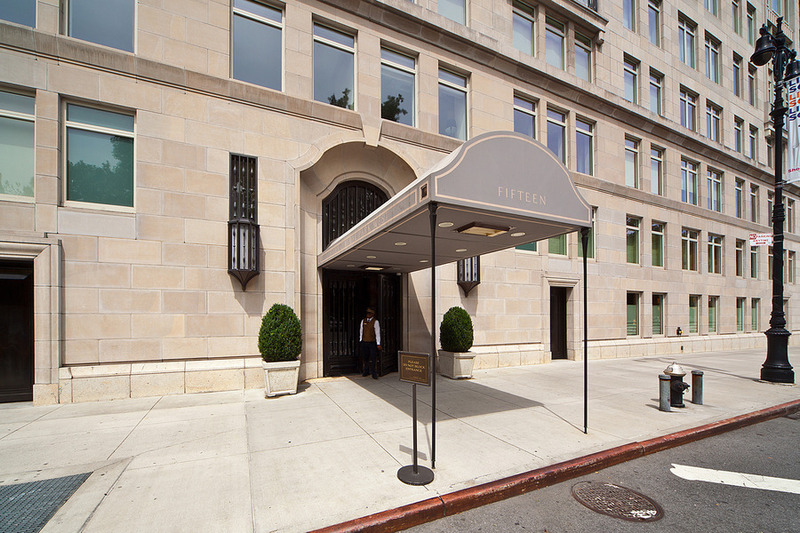 The building describes the dining offering as a “private dining service with an in-house chef provides full catering for Fifteen Central Park West residents desiring anything from a four-course custom menu for 80 guests to an at-home romantic dinner for two.” The restaurant is known to host special meals year-round including women’s lunches with speakers covering varying topics and a special brunch on Mother’s Day each year. The trend of resident-only dining is not confined to New York. 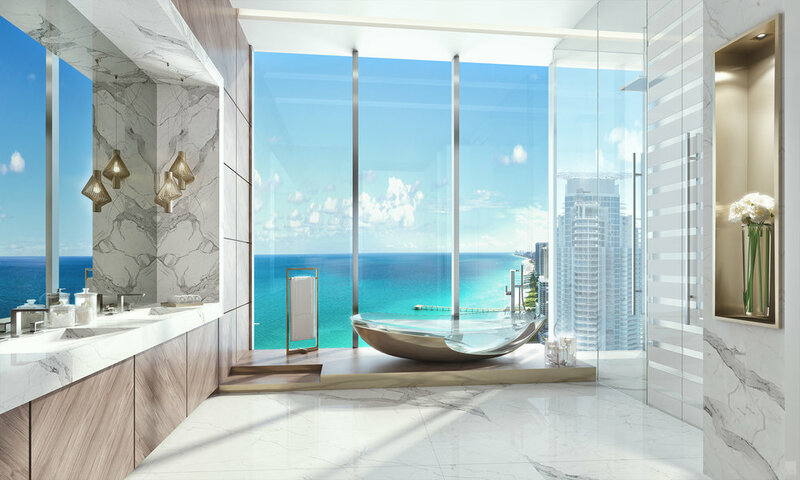 One of the latest luxury high-rise to hit the shores of Sunny Isles Beach, just north of Miami, has embraced the exclusive trend as well. 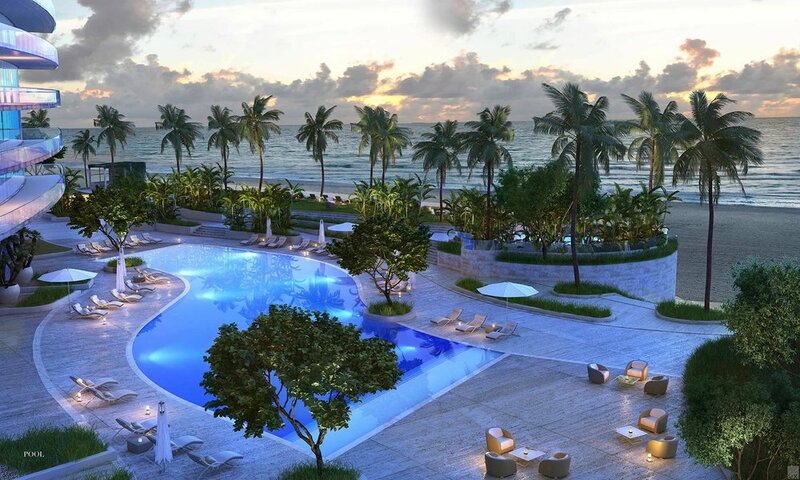 Jade Signature, designed by famed architects Herzog & De Meuron, offers a truly luxurious amenities package which allows residents to experience resort-style living on the shores of South Florida. 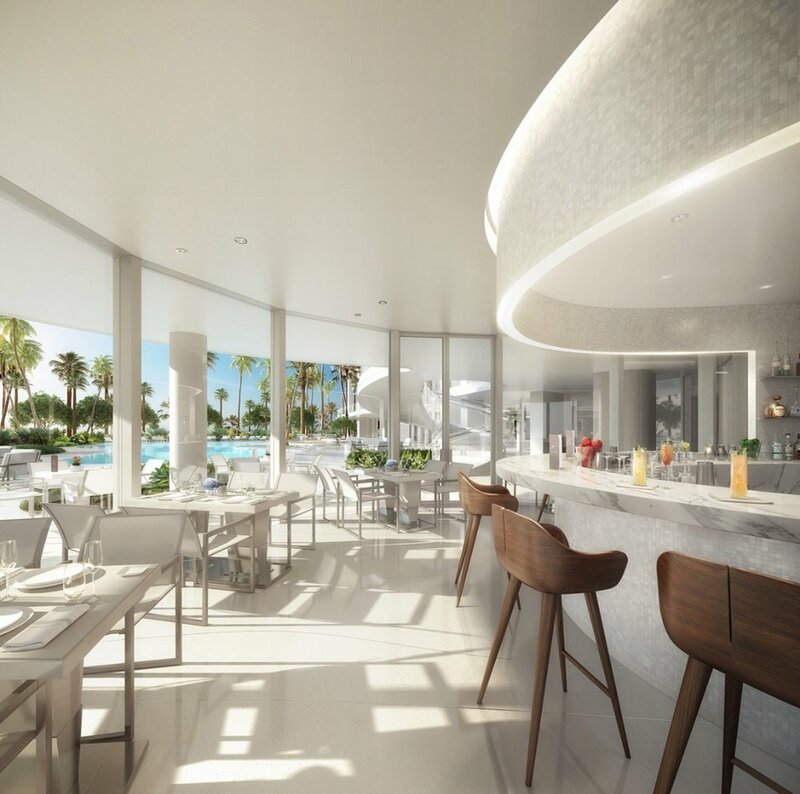 The Jade Signature Beach Bar & Grill so residents can dine pool and beach side without having to head back their residences. The experience is similar to that of many beachfront hotels. Is Downtown Driving the Luxury Market? We’ve written many articles on the resurgence of downtown, from the luxury buildings along The High Line, to the rebirth of Lower Manhattan in the post 9/11 era. 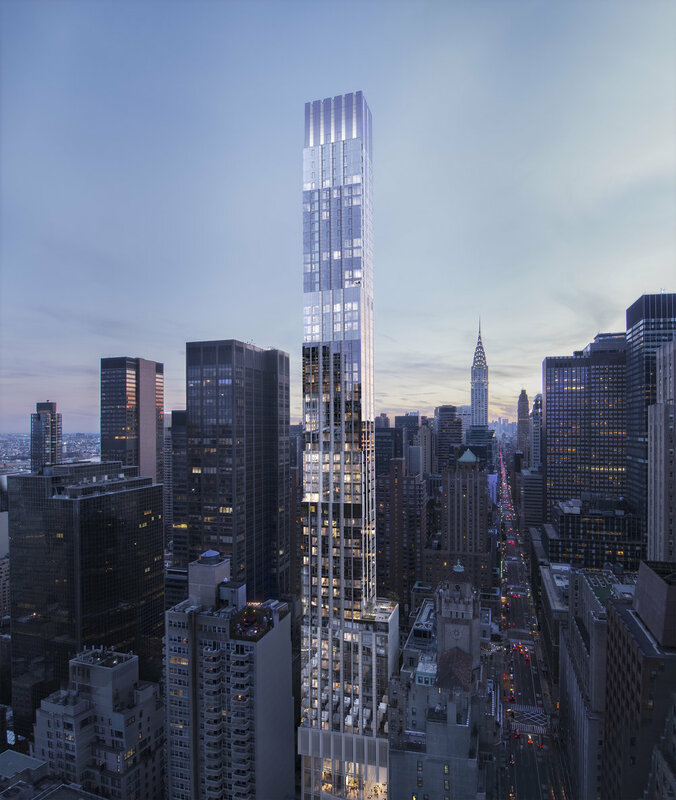 While Midtown developments, such as 423 Park Avenue, have certainly broken headlines for record prices, or price cuts on resales in buildings such as One57, downtown has provided much support for the overall Manhattan market. Midtown continues to see high prices for unit while volume has seen an uptick downtown. 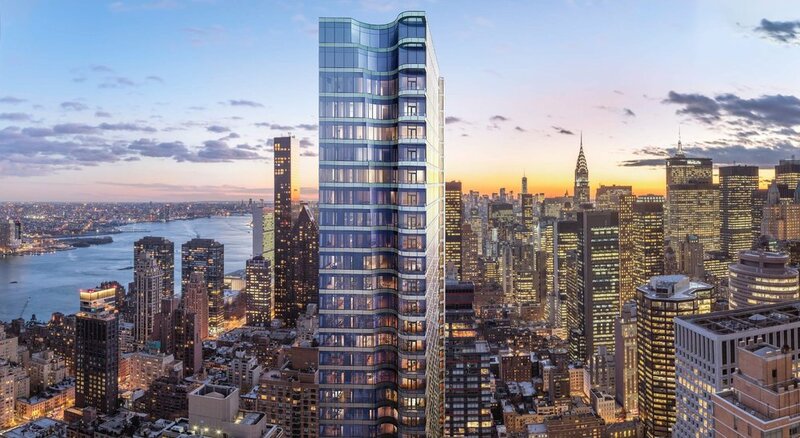 During the middle week of May, Olshan reported a staging figured that showed the influence of downtown Manhattan on luxury transaction. Of the 21 contracts signed during that week for properties priced $4M and above, 10 were south of Midtown. Of the volume in Mid-May, nearly 50% was driven by properties in downtown Manhattan. Buyers are flocking to Lower Manhattan for various reasons ranging from inventory, to empty nesters downsizing and looking for a new pace of life, to easy access to some of the best shopping and dining in the city. 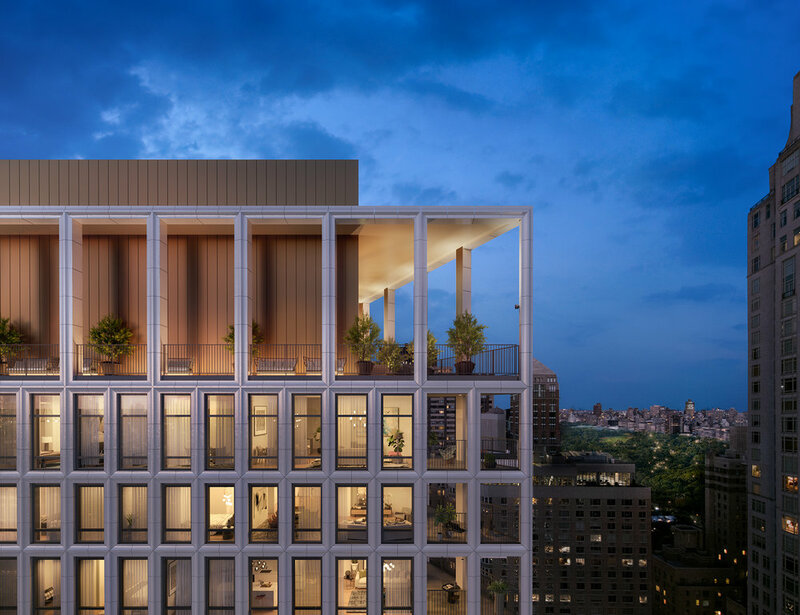 Selection of New Development inventory in Downtown Manhattan is extensive in all neighborhoods, and these projects are bringing the most coveted architects and interior designers coupled with luxurious amenity offerings. The High Line is dotted with new buildings from the likes of Zaha Hadid and Soo Chan. In Flatiron, 45 East 22nd Street has been creating buzz and offers some of the best views of the city. 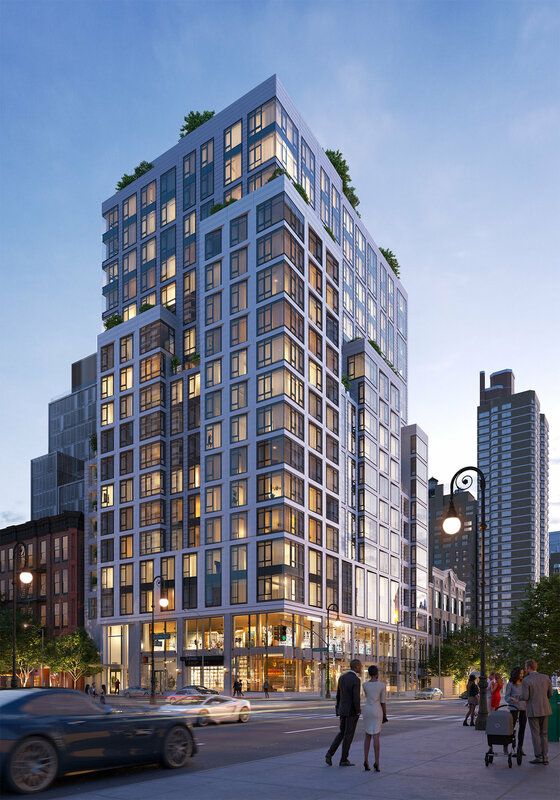 Tribeca has a flurry of new projects including New York’s first Four Seasons Private Residences at 30 Park Place, the Woolworth Tower Residences, and many others such as 30 Warren and 108 Leonard Street. Meanwhile, the Financial District has welcomed 50 West Street and looks forward to the arrival of One Seaport and 130 William Street. In addition to a variety of inventory, Lower Manhattan is attracting buyers with cultural offerings as well. The best stores and restaurants have all opened spaces from SoHo to the Financial District. Additionally, new luxury hotels such as the Four Seasons and The Beekman offer a swanky place for guests to say and locals to frequent. The Seaport is experiencing perhaps the biggest revitalization – we previously discussed the overall redevelopment of the neighborhood after it was battered by Hurricane Sandy. Most notably, Mr C is slated to open very soon. This will represent the Cipriani family’s first hotel venture in New York City after is launched the Mr. C brand in Beverly Hills in 2011. 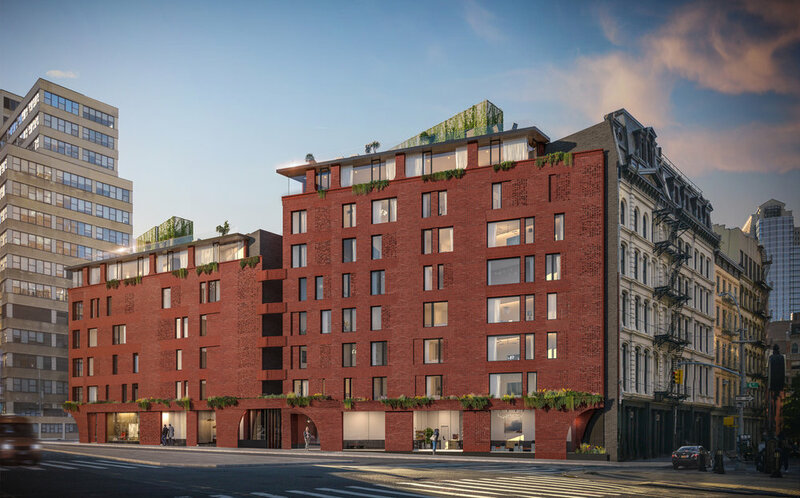 The hotel, which will be run by Ignazio and Maggio Cipriani, will have 66 rooms, a Cipriani restaurant, and is being designed by Thomas Juul-Hansen. More exciting things are coming to downtown as it continues to establish itself as a culinary, entertainment, and shopping destination. We are continuing to track the development of the Seaport District and have the latest timeline of events. 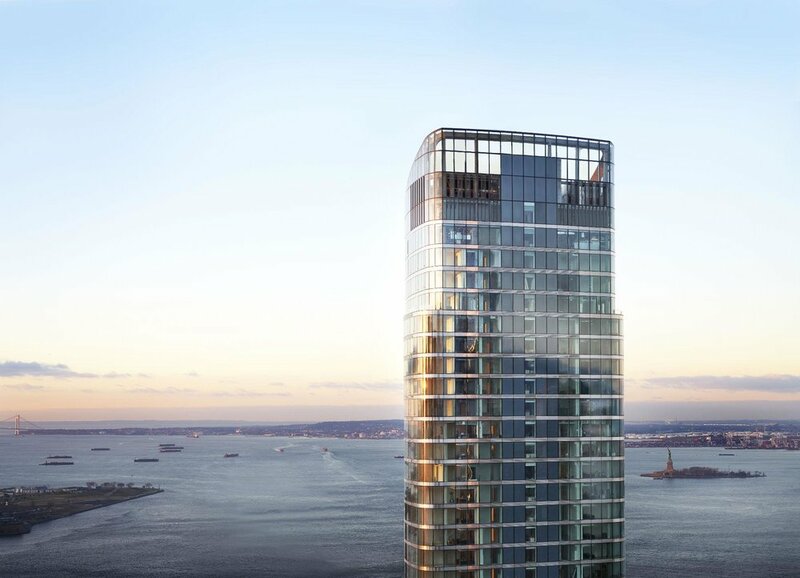 The Victoria Shtainer Team currently as an exclusive rental opportunity on the market at the brand new 50 West Street designed by Helmut Jahn. Our listing, Unit 20B, is one of only a handful in the building that features a double-height living space with soaring 20' ceilings. We have access to all the hottest inventory in Downtown Manhattan! Contact us so we can create a tailored search and property tour for you. For those in the Northeast East and Midwest, winter can be quite brutal and feel seemingly longer than any other season of the year. The winter season thus far has been brutally cold in New York City, yet those looking for an escape only have a 2.5-hour plane ride to be transported to sun and sand. Miami is often times referred to as the 6th borough of New York City given the quick and easy plane ride. 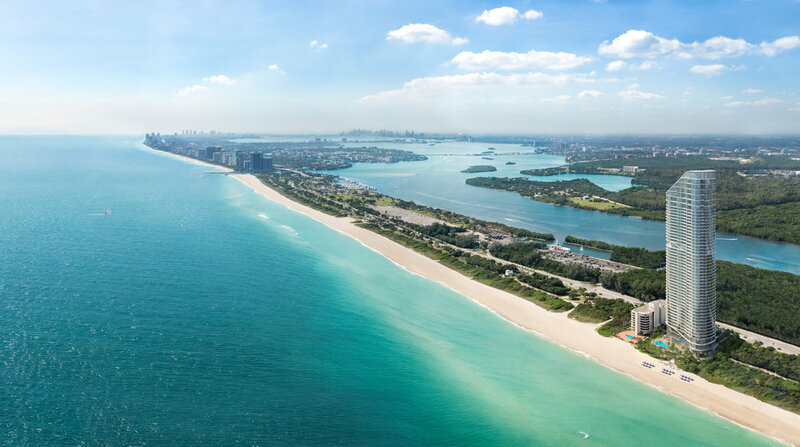 Some of the hottest developments are under construction or nearing completion in South Florida. Similar to New York, some of the biggest names in architect and design are backing these new projects in Miami. Looking at the Miami luxury market, we see some similar themes to what we have previously shared for our outlook for the Manhattan luxury market. One of those is opportunity as a result of uncertainty. There is no doubt that cranes have been dotting the South Florida skyline from Sunny Isles to Brickell. Some of these projects have foreign investment, with a large proportion in Miami being from South America, which has caused concern for some as it relates to foreign exchange rates and the ability of those invested to maintain their stake and close. We do not feel overly concerned about this, but rather look at the opportunity of a Buyer’s Market that has resulted in South Florida and the opportunity to purchase some of the best product the area has seen at the best prices. The Victoria Shtainer Team is pleased to market 3 of the most notable new developments in the Miami area – The Ritz Carlton Residences Sunny Isles, Muse Sunny Isles, and Echo Brickell. 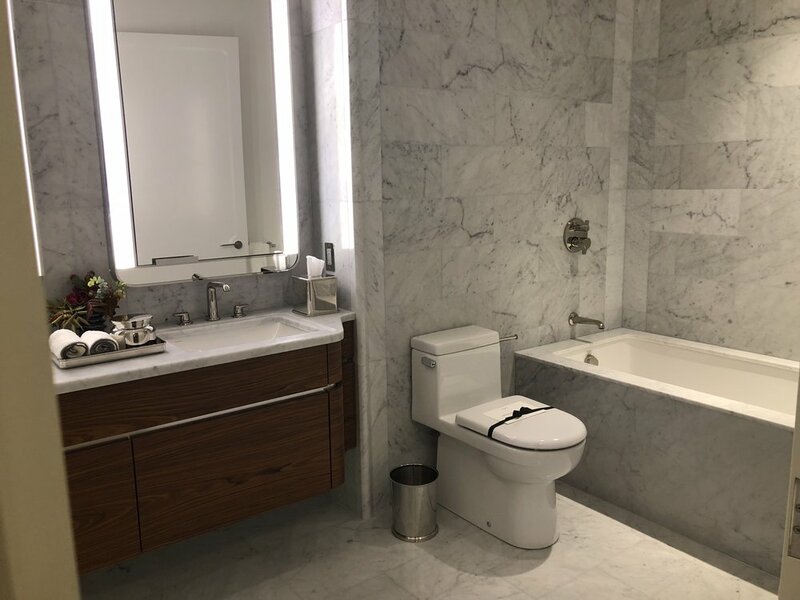 The Ritz Carlton Residences is a collaboration between some of the best names in the industry including development by Chateau Group and Fortune International, Architecture by Arquitectonica, design by Michele Bönan, and lifestyle services by the renowned Ritz Carlton Hotel Company. The property is situated on 2.2 acres with 250 feet of pristine beachfront. 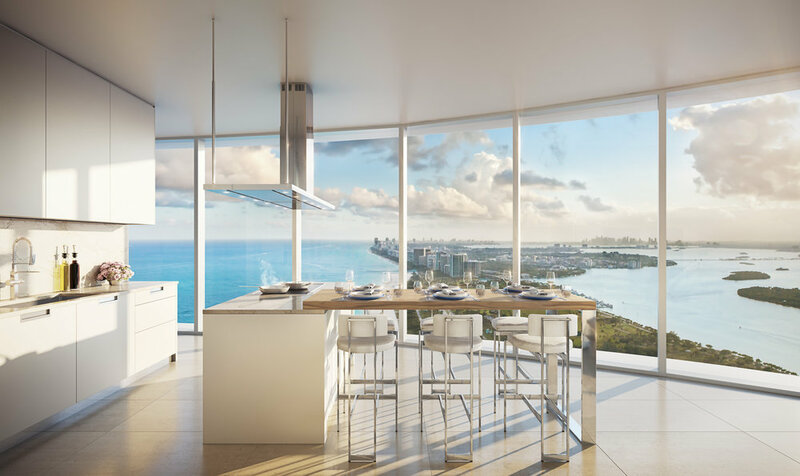 Rising 52 stories tall, the Residences will be a new landmark along the Sunny Isles shore, positioned between Bal Harbour and the Aventura Mall. 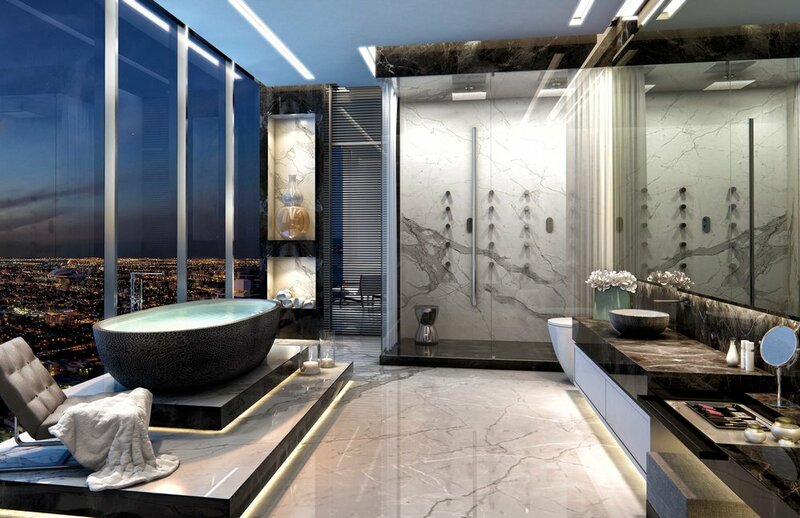 The property will be managed by the Ritz Carlton Hotel Company, offering residences an unparalleled collection of lifestyle amenities and services. We are pleased to market one of only a few of the crowning penthouses in the building. Penthouse 5002 is a full-floor 5 bedroom comprised of 6,085 interior square feet with 3,730 exterior square feet. Echo Brickell is the result of a first-time collaboration between conceptual designer Carlos Ott and the esteemed innovators at yoo Studio. 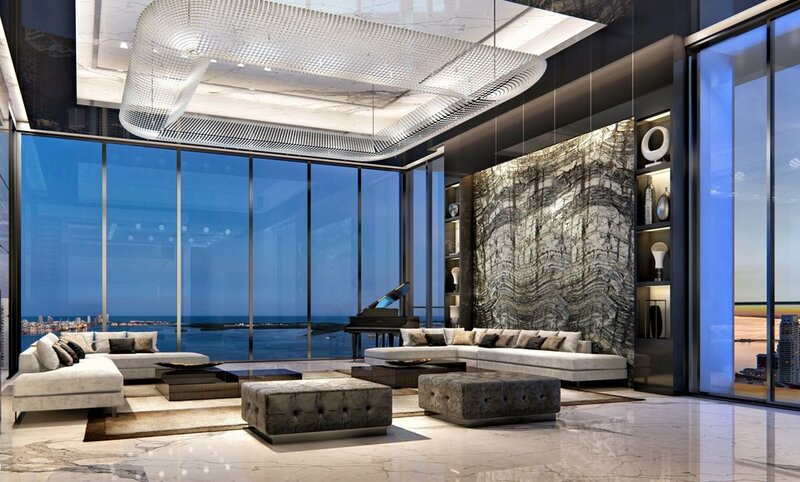 With only 180 residences, Echo Brickell is the most exclusive architectural icon south of New York. Echo Brickell will further distinguish itself by offering larger floor plans than those that are typically found in the Brickell and Downtown condominium markets. Featuring a variety of one-, two- and three-bedroom floor plans from the 9th to 42nd floor, 28 opulent penthouses will sit atop the highest floors of the sculpturesque tower. Echo Brickell’s state-of-the-art residences will redefine the standard of excellence for South Florida high-rise living. Amenities include 4,000 square foot fitness center, spa, resort-style poolside food and beverage service, and pet walking services. Victoria was originally quoted in The Wall Street Journal about What to Consider Before Buying a Vacation Home. You've decided to make the plunge and purchase a vacation home. Buying a second home is a great way to accumulate additional wealth, and as an investment, generate cashflow in the interim. There is a laundry list of things to consider before buying your vacation. Speak to your real estate broker and qualified tax adviser before making your investment decision. We've created a list of some of the most important things to consider and ask before you buy your vacation home. Purchasing a vacation home as an investment vs. for strictly personal use is certainly a different process. We focus on a purchase as the former. Is it better if you live close to the property to do chores, show it, etc.? Proximity to a property is always helpful, as it allows the you to easily access it, check up on it, and be able to respond more quickly to any issues that arise If you are not close the property, consider hiring a broker to handle the rental, property manager to oversee the property and fix any problems, liaise with local plumbers, gardeners, etc. If you are renting the property for income, you always want to ensure a seamless process for the prospective renters. If you want to own a home located a significant from your primary residence, be aware of potential challenges. The main challenge of remote ownership is dealing with the property over the phone, email, etc. and not face to face very often. Any interaction with those overseeing the property will be "digitally." What investors is this ideal for, and who should not get involved? Vacation homes can hold sentimental value for a lot of owners/families, thus those that get attached to the property are not ideal to have a vacation rental as the objective is to have it rented out during the peak-season times of the area to generate maximum income. Vacation home investments are most Ideal for someone that can meet the full tax deductibility rules of a vacation home so they can take full advantage of the home from both a price appreciation standpoint as well as from the rental income received while holding the property. It is also important to have the mindset that owning a vacation home for an investment does not mean its a "vacation" for you- expect all the unexpected that arises when multiple people are rotating throughout the property and treat the property from the "Im on vacation" mindset. What would be your advice to someone thinking of property hunting this spring and summer? In the current market in vacation destinations such as The Hamptons, there is more leverage towards the buyer as the seller is dependent on the market one is looking in. We work in The Hamptons because of its proximity to the city and the preferred location for a second home for many NYC residents. If you are considering buying a vacation property in The Hamptons now, it is a buyer's market in the area, especially at high price-points. While there market has picked up a bit on the East End, there remains a large amount of high-end inventory that has been spending a longer time on the market....this works to the buyer's favor. If you are considering looking for a rental for the summer season, it is always important to be thorough with your search and always start your search earlier than you would expect! When you decide on a property, be sure to double-check items such as who is paying utilities? is it your responsibility as the tenant to pay for expenses such as pool heating, gardner, housekeeping, etc?, Are pets allowed? If you are considering a longer-season rental, see if there is negotiability in the price. Owners are often willing to provide a better rate to someone that commits to renting the full season (Memorial Day through Labor Day) vs. someone who wants to rent a single week in July. Are lenders welcoming to people buying second properties? Every lender has different "rules", but generally if you are purchasing a second home and are in solid financial condition, the lender should not have a problem providing a loan. Given the increased risk to the bank of having a second mortgage, they may make you provide an increased downpayment so you have some "skin in the game." What are the tax rules? To get the most tax benefit, do you have to limit your own use of the property? Rental income for this type does not have to be reported!